Sometimes I wonder why I stick with this woodworking thing. 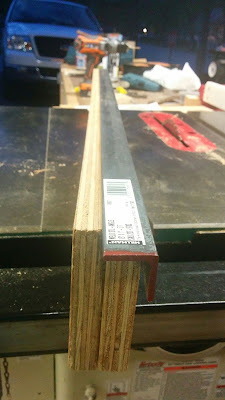 I'm working on a very large crosscut sled for the table saw. This beast is nothing fancy, just 24"X40" of sliding plywood and two fences. The plywood was not straight after gluing the halves together, but I didn't expect it to be so. I originally purchased an aluminum angle to serve as a stiffener/straightener. The plywood had other plans as the aluminum angle was deformed to conform to the fence shape. The next step was to buy a piece of steel to serve in place of the aluminum. The plywood won again as you can see. What you can't see are the six screws trying to hold it in place. At this point I'm looking for other options. Maybe I'll hit Google/youtube to see what others are doing. This afternoon project has turned into a multi-day fiasco. So, I'll close as I began. Heavy sigh.